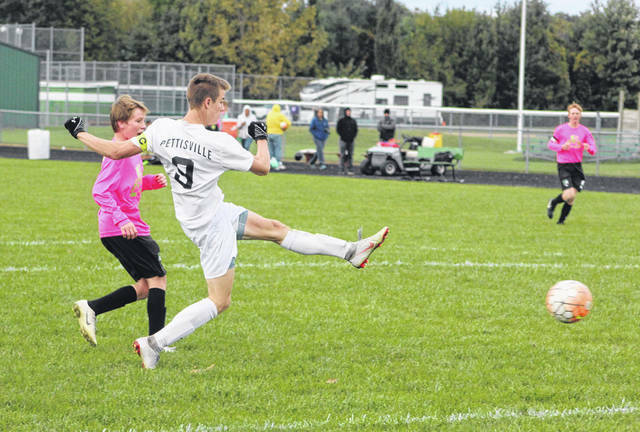 Pettisville’s Detric Yoder puts in the third of his four goals Thursday in a win at Delta. The Blackbirds were victorious 6-1. Braden Risner of Delta, right, takes possession from Harley Crossgrove of Pettisville. 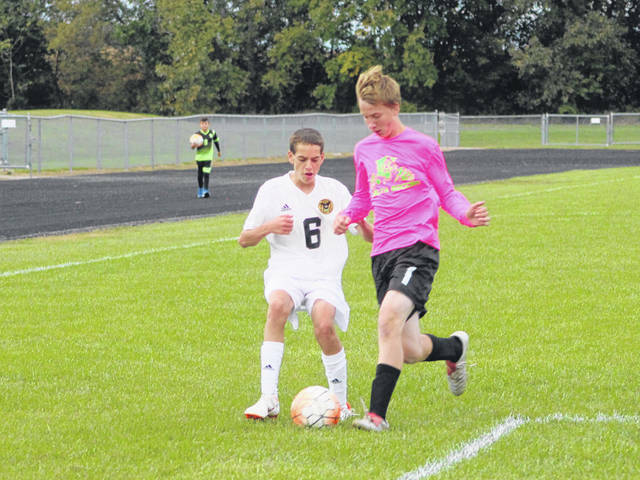 Pettisville broke open a tight game, outscoring Delta 6-0 after a 1-0 deficit to defeat the Panthers on their home field, 6-1, Thursday in boys soccer. Delta put one into the net first, when Carson Chiesa hit Tyler McCullough in front of the Blackbird goal and he slid it past diving goalkeeper Brayden Barrett for a 1-0 lead at the 25:01 mark of the first half. Later in the half, Peyton Webster was awarded a direct free kick for the Panthers. However, it went right to Barrett who made the save. Just 23 seconds later, with 7:44 left in the half, Pettisville’s Detric Yoder found the back of the net to knot the score. The Panthers looked to regain the lead in the early minutes of the second half. Around the 30-minute mark, the Panthers’ Simon Munger and Nicolas Gardelli had shots stopped. Munger fired one to the net that was slapped away by Barrett, then Gardelli’s rebound was thwarted when the Blackbird keeper gobbled it up. Pettisville then turned its good fortune into offense at the other end. Following an initial shot that was stopped, Yoder slammed home his second attempt to put the Blackbirds in front 2-1 with 28:56 remaining. Harley Crossgrove threw one in down near the Panther goal, and it found its way to Yoder who scored to make it a 3-1 game with still over 20 minutes left. “Detric is a special player and draws a lot of attention and still excels,” said Pettisville coach Barnaby Wyse. “He leads the team in both scoring and assists. He has more than 70 career goals so he will score on the best. Delta played a high line of confrontation on defense and there was plenty of space behind them for Detric to find and win (one on one) battles. They made it 4-1 on another Yoder goal, thanks to a centering pass from Crossgrove at the 13:21 mark. Eli Grieser added a pair of goals in the final 10 minutes to reach the final score. Both teams opened tournament play today. Pettisville was at Maumee Valley Country Day, while Delta traveled to Genoa.